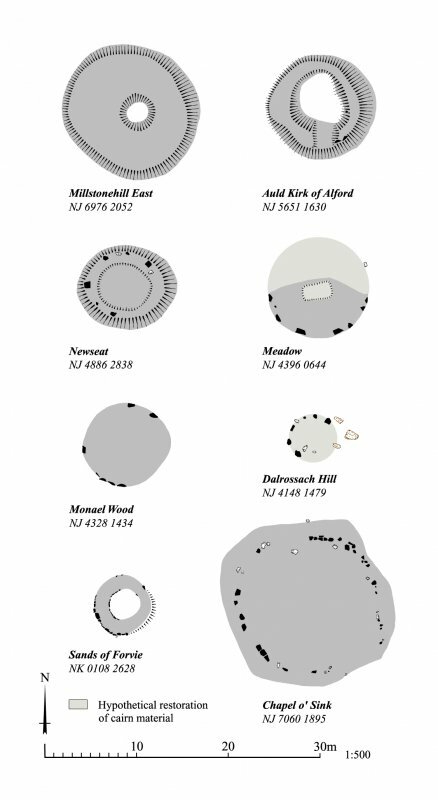 Plans of a selection of cairns and ring-cairns in Donside. 300dpi tiff copy of EPS file. 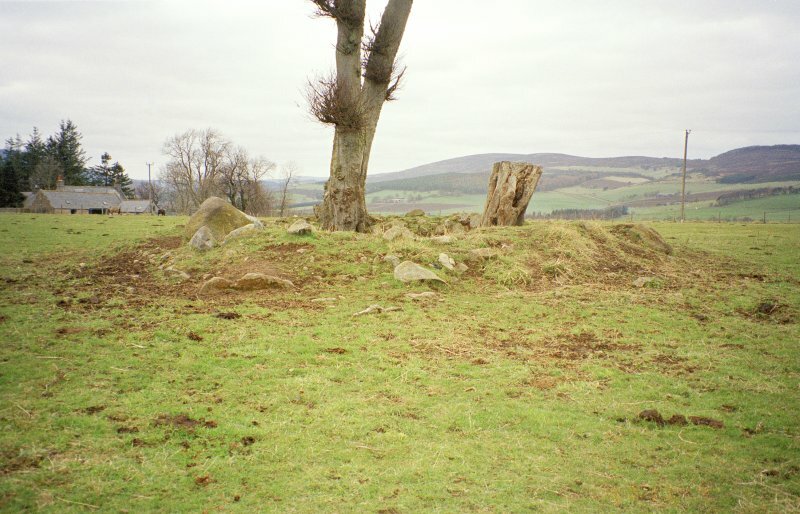 General view of possible cairn and stone circle. Original negative captioned 'Remains of Stone Circle called "The Auld Kirk" at Greystone Alford 1904'. (NJ 5651 1630) Stone Circle (NR) Called Auld Kirk. Greystone, The Auld Kirk, the disturbed remains of a triple concentric circle of stones 33ft in diameter. The interior is quite flat and is enclosed by a rounded ridge, partly shaped on the outside into a dike. The innermost circle, 28ft in diameter, is of long and rather narrow blocks set on edge of which eight are in situ: the middle circle is of broad massive stones, from 2ft 6ins to 3ft high, of which three remain: the outer ring is also of long, rather narrow stones, of which only two remain, set on what was originally the true base of the ridge. There are no indications of a cist whithin the circle, and the date of its disturbance is not known. All that remains at the site of this stone circle is a circular stony dyke, about 9.5 metres in diameter, surmounted by the remains of a ring of trees. The dyke does not appear to have been part of the original structure and was probably built at the time of the destruction of the circle and the planting of the trees. Mainly as planned by Coles (1901) but his assessment of the site as a triple concentric circle is suspect in that several of the larger stones are loose and obviously not in situ and some of the others merely the base of the dyke. Visited by OS (RL) 12 September 1968. What may be a robbed ring-cairn lies in an old copse in a field of rough pasture on the crest of an E-facing spur. 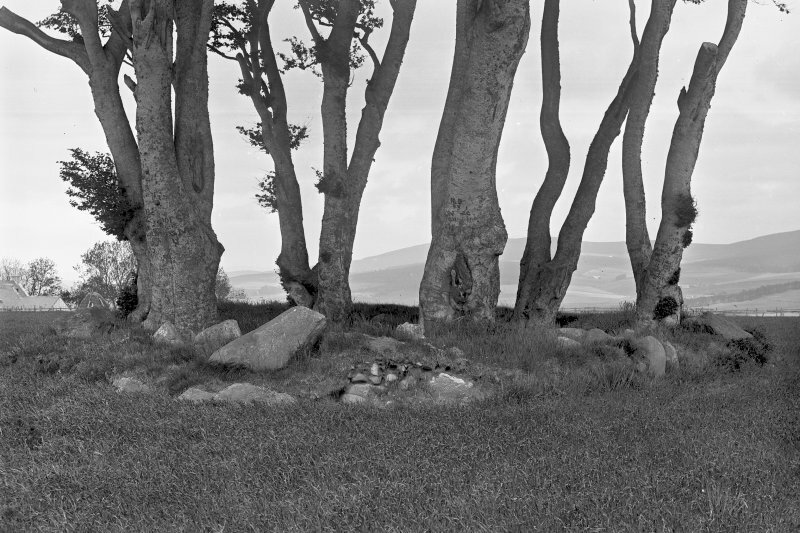 The cairn has been much disturbed, its centre now largely removed by stone robbing, and a ring of trees planted 'to preserve its formation' has caused further damage (ONB 1869). Overall the cairn measures 11.5m in diameter, though some of the mass of stones visible on its surface is probably the result of modern field-clearance. Nevertheless two stones are set up on edge on the S, but whether they belong to an inner or outer kerb is not known. Coles described three concentric circles of stones, and placed these two on the innermost ring. He observed three 'broad and massive stones' forming the intermediate ring, but only that displaced on the NE remains today, and of his outermost line only one now survives: a long, narrow earthfast stone on the SE (Coles 1901, 209). Ritchie's photograph of the site, taken from the SE in 1904, is roughly contemporary with Coles' plan, and many of the stones that are no longer visible can be seen. The image captures the ring of mature trees, apparently lying on the inner edge of a crudely formed stony bank. This ring-bank still survives, though much altered and added to, and a line of boulders revetting its inner edge is visible between two tree stumps on the NW: whether part of the cairn or simply an enclosing tree ring cannot be determined. The removal of a tree may account for the break in the bank on the S.
Visited by RCAHMS (ATW, ARG) 16 September 1999. Information from Historic Scotland, scheduling document dated 2 March 2007. 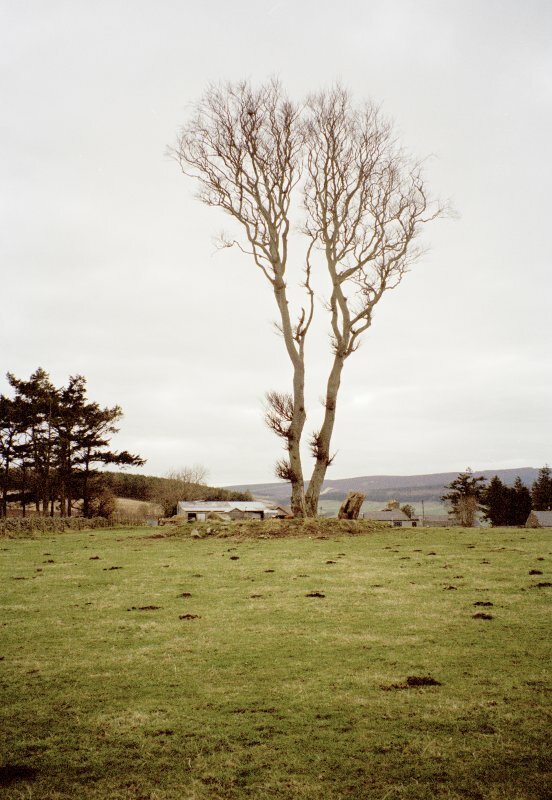 What are probably the remains of a cairn are marked by a lone tree and a rotting stump at the edge of a field about 100m north-north-west of Greystone. 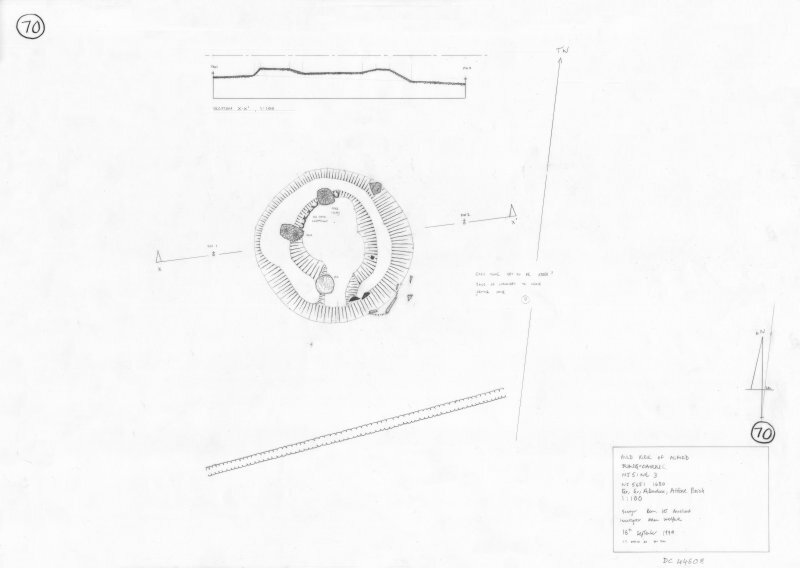 Little of the cairn is currently visible, however, hidden beneath a ring-bank 11.5m in overall diameter, which was constructed and planted in the 19th century to help preserve the remains of the monument. Faced externally with small boulders, as can be seen most plainly on the west-north-west, the ring-bank now measures up to 4.2m in thickness by up to 0.6m in height, but a significant proportion of the material of which it is composed is field clearance, dumped over its lip into the interior since 1900; the most recent addition is a large boulder almost 1.5m across lying on the bank on the south. If it were not for the tradition of a ‘circle of large stones’ or a Druidical Temple here (NSA, xii, Aberdeenshire, 499; Name Book, Aberdeenshire, No. 5, p 21), and a plan prepared by Coles in 1900 (1901, 208–9, fig 18), it would be difficult to demonstrate convincingly that there was a monument here at all. Nevertheless, two contiguous slabs set up on edge on the south-east, the tops of which stand 0.7m above the surrounding ground level, are almost certainly outward facing kerbstones, the survivors of a row of three shown here by Coles. Coles believed that these belonged to the innermost of three concentric rings of stones, showing another three slabs diametrically opposite on the north-west, and two on the east. These other stones have been either removed or buried; in this respect what may be the very top of an upright slab is flush with the turf on the crest of the ring-bank on the north-west. Coles’ middle ring comprised three stones, which apparently stood between 0.75m and 0.9m high on the crest of the ring-bank, but of these nothing can be seen, unless the stone currently lying on the outer scarp of the ring-bank on the north-north-east is the one Coles showed hereabouts. If so, it has been rolled off the crest, suggesting that these were no more than field-cleared boulders, perhaps dumped since the first OS surveyors reported in the Name Book that ‘the stones which formed the circle are now almost invisible above the surface of the ground’ (Aberdeenshire, No. 5, p 21). Of the two stones that made up Coles’ outer ring, only the one on the south-east is still visible, protruding through the turf at the foot of the ring-bank; its status is unknown and it may even be outcropping rock. Despite having entered the antiquarian record as a stone circle, Auld Kirk o’ Alford has only been included as a possible recumbent stone circle by Barnatt, who was struggling to interpret Coles’ triple circles (1989, 286, no. 6:48). 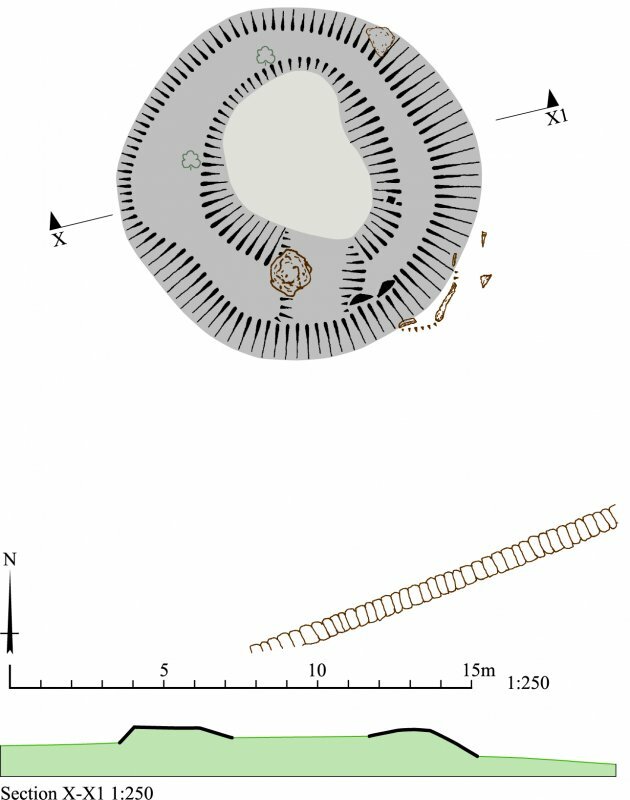 Only one of these circles stands scrutiny, and this is probably the external kerb of a cairn or ring-cairn measuring no more than 9m in overall diameter. This kerb was relatively massive and quite large enough for it to have acquired the status of a stone circle in local lore, and this in turn may account for the name of the neighbouring farm, Greystone.